I went to Paris when I was 13 years old, which seems like a million years ago. So many great memories: The Eiffel Tower, walking through the Louvre, Notre Dame, Sacré-Cœur and being in awe that U2 filmed their video for “Two Hearts Beat as One” there – and of course, breaking out on the steps and singing their song (#AwkwardTeenagerWithABadPerm). There were also memories of staying in a Japanese-owned hotel, eating mostly at Vietnamese restaurants, and getting in a car accident right outside of the tunnel where Princess Diana was later tragically killed (I’m still so sad about her passing). I’m assuming this is not a typical Parisian tourist thing. I was so grateful to have been in Paris, but I can’t help but to want to go back and have a do-over, especially in terms of food…and, um, transportation. Don’t get me wrong, the Vietnamese food was fantastic. But I was in Paris! I wanted to experience not only the famous sites and history, but the food. To me that’s part of the history and culture of any place. After reading about Julia Child’s first meal in Paris in her autobiography My Life in Paris (and one of my favorite books of all time), I realize THAT’S what I wanted. The way she got giddy about having sole meunière made me want to book a flight to Paris and enjoy it with her. Ina Garten does the same thing for me. I grew up watching Julia Child on PBS and though there is no replacement for Julia Child, Ina Garten is my modern-day Julia Child. When I picked up her cookbook Barefoot in Paris, I wanted to make every single recipe. It’s been about four years since I’ve picked up Barefoot in Paris and I’ve made a good amount of her recipes, but not nearly as much as I would like to. 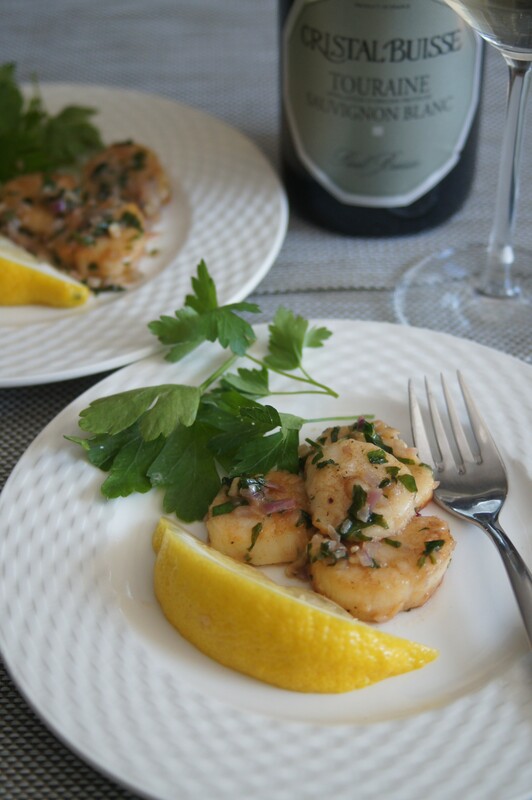 One that I’ve made on repeat is her Scallops Provençal. Ina (in my fantasy life we’re on a first name basis because we are the best of friends in the Hamptons) says in the intro to this recipe, “It doesn’t get any easier than this.” And she is absolutely right. I’m not known for being super fast in the kitchen, but I was amazed at how quick it was to put this entire recipe together. It took about 15 minutes, which is totally unheard of for me. Though, I have been known to whip up instant ramen in a flash. Wait, that goes for everyone, doesn’t it? I guess that doesn’t count. One of the best parts of this recipe is that I got the scallops from Jordan Brothers’ Seafood at the Medfield Farmers’ Market. The farmer’s market is held every Thursday from from 2:00-6:30 from June to September. And since today is Thursday, I know where I’ll be. The scallops were a good size and really fresh. They also go perfectly with a dry white wine, like Cristal Buisse Touraine Savingnon Blanc, which I picked up at Larkin’s Liquors in Medfield, and conveniently steps away from the farmer’s market. Another place I know I’ll be later. 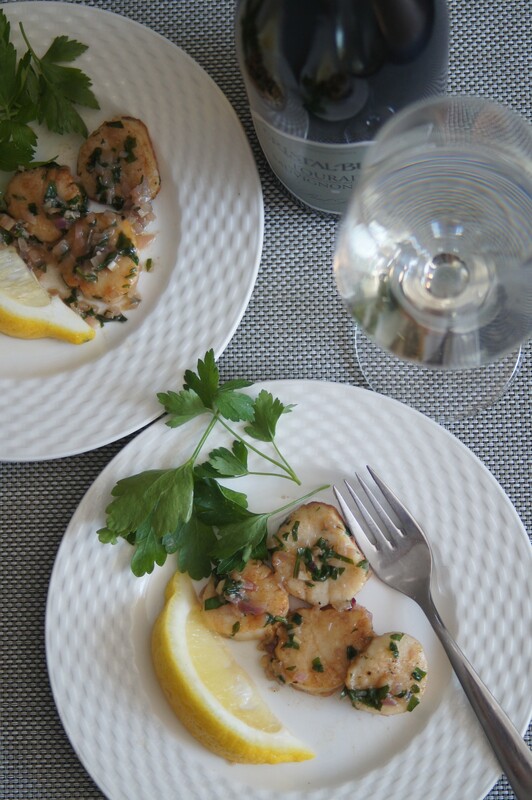 If you’re not a big fan of scallops, I think this would work with shrimp too and maybe even chicken. I haven’t tried it any other way, but the sauce is so good that I’m sure it would go well with just about anything. This recipe is also perfect with a good piece of crusty bread to sop up the sauce. I’ll be sopping away on my next cheat day. So whenever I think about Paris and wanting to go back I’ll make something like Ina’s Scallops Provençal. I know that one day (hopefully soon) I will be back. But for now, there is nothing like good, flavorful food like this to transport you to amazing places. Serves 3. If doubling this recipe, make it in two separate pans. If you’re using bay scallops, keep them whole. 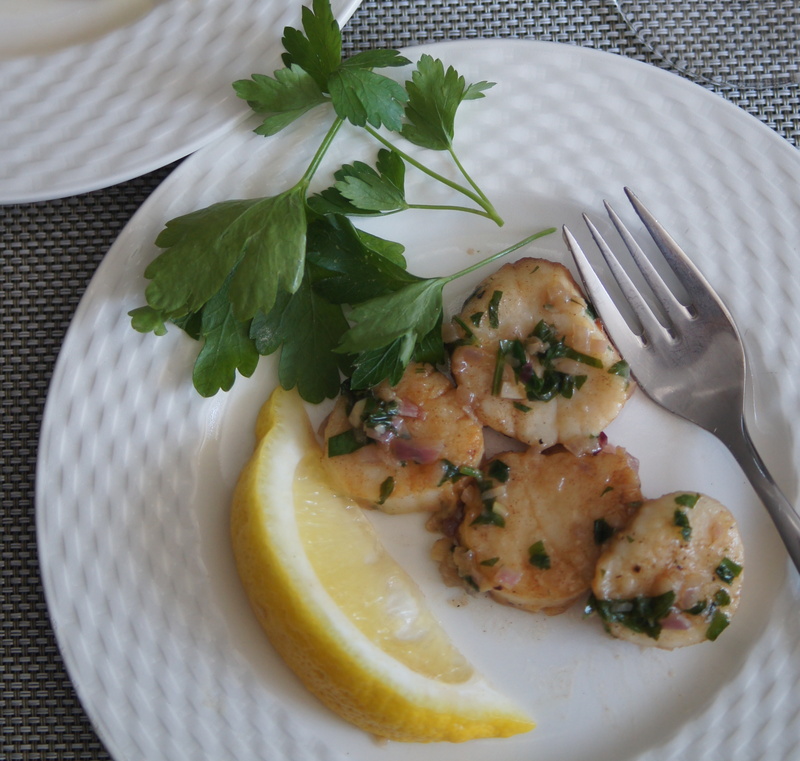 If you’re using sea scallops, cut each one in half horizontally. Sprinkle with salt and pepper, toss with flour, and shake off the excess. In a very large sauté pan, heat 2 Tablespoons of the butter over high heat until sizzling and add the scallops in one layer. Lower the heat to medium and allow the scallops to brown lightly on one side without moving them, then turn and brown lightly on the other side. This should take 3 to 4 minutes, total. Melt the rest of the butter in the pan with the scallops, then add the shallots, garlic, and parsley and sauté for 2 more minutes, tossing the seasonings with the scallops. Add the wine, cook for 1 minute, and taste for seasoning. Serve hot with a squeeze of lemon juice. Now I’m hungry for bacon-wrapped scallops. Bonefish Grill in Raleigh, NC serves them as an appetizer, but I usually make them my dinner (I keep the whole appetizer to myself!) and pair it with a Cesar salad. Will have to give these a try. But where in Montana can I get really fresh scallops!